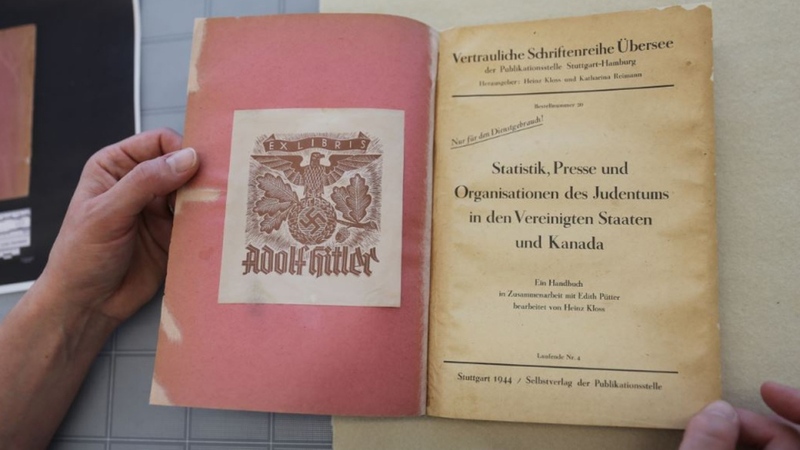 OTTAWA -- Library and Archives Canada has procured a rare book, once owned by Adolf Hitler, that compiles population statistics on Canadian and American Jewish communities. Those who procured it say the information within the book would have likely been the "building blocks" for Hitler to carry out his "Final Solution" plan for eradication of all Jewish people in North America had the Nazis won the Second World War. The title of the book translates to "Statistics, Media, and Organizations of Jewry in the United States and Canada," and it was unveiled to media in Ottawa on Wednesday. "It's an in depth statistical report or census, of the American and Canadian Jewish communities," said Michael Kent, Library and Archives curator of the Jacob M. Lowry Collection. This Judaic collection includes other important holocaust remembrance items. Librarian and Archivist of Canada Guy Berthiaume began the unveiling event stating that: "historical significance does not come with caveats." He and Kent went on to acknowledge that, while the item may contentious, they defend its acquisition as key to a full historical picture of the realities of the Second World War, Hitler's rule and the Holocaust. The book was compiled in 1944 and contains the Hitler bookplate meaning it was part of his personal library. It is 137 pages long and was written in German, but many of the names of cities are in English. It details how many Jewish people were living in both major and smaller cities, the language they spoke, their ethnic backgrounds, and key Jewish organizations in these communities. It was acquired in June 2018, after Library and Archives noticed a "reputable Judaica" book dealer promoting having the book on social media before it was listed for sale. The book was compiled by Heinz Kloss, who was a German linguist that had contacts among Nazi sympathizers in the U.S., where he is known to have visited between 1936-1937. He was responsible for producing official info for the Nazi regime. The book was a confidential report marked for official use only. It was purchased for US$4,500, which would be equivalent to approximately CAD$6,000 based on the exchange rate at the time. Of that, $5,000 of the funding came from private donors who can contribute to the Library and Archives through an online portal on their website. The remaining balance of approximately $1,000 came from their budget, meaning taxpayer dollars. It is the first purchase that Library and Archives was able to make with public donations. Most of the national institutions' 22 million publications are donated or have to be sent to the Library as a legal requirement if published in Canada. 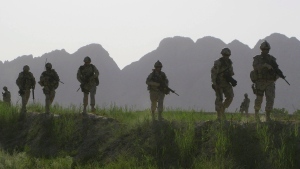 "In this case, it was not published in Canada, it was published in Germany and was being sold in the United States and so we had to acquire it, we had to buy it, but that's not our usual modus operandi," said Berthiaume. Kent described the item as "invaluable," and said the benefits and potential educational value that can be gleaned from studying it largely outweighed the potential pushback from critics who see this purchase as glorifying Hitler. "While this is certainly a creepy item, the decision to acquire it was simple in light of our mandate, though sometimes you have to think beyond your mandate," Kent said. "When we looked at this book and we saw the rise in Holocaust denial that is currently happening and we saw the rise in xenophobia that’s currently happening in the world, the chance to acquire an item like this reminds us the importance of memory institutions… and the role we play in ensuring the memory of the Holocaust is preserved." 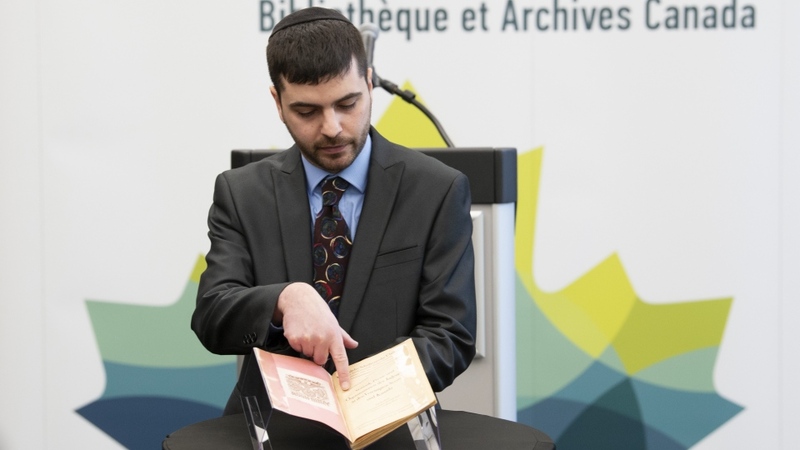 The book will be displayed publicly in Ottawa on Sunday afternoon at the Library and Archives as part of the International Holocaust Remembrance Day Commemoration. There will be additional security on scene for the event. "In part, just because we’re expecting a very large crowd and in part because we’re doing an event related to holocaust memory and we just don’t know who might show up," Kent said. After this weekend's event, the book will be available to researchers and will be digitized and posted online. 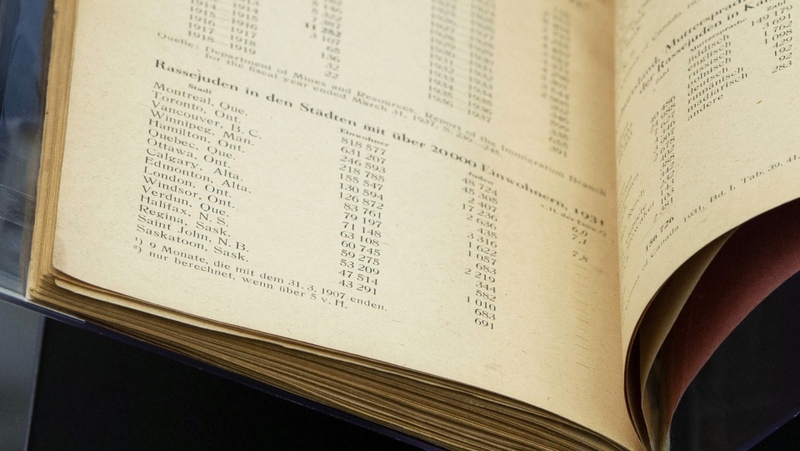 Among what is yet to be gleaned from the book is a comparison to the numbers of Jewish people listed in Canadian cities — 3,316 then in Ottawa, for example — to Canadian census data at the time. Once it is digitized it will be available on the Library and Archives website where there is hope that some crowdsourced research will be done by interested Canadians, including translating sections or helping piece together how the book ended up in the United States. 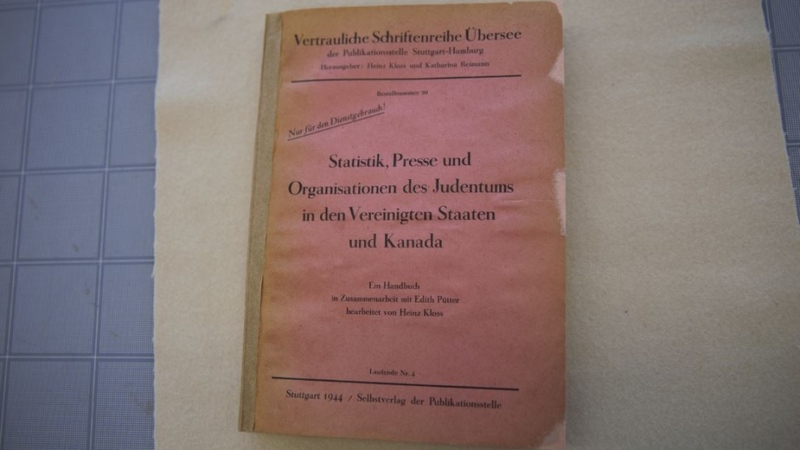 The 137-page German language report, Statistik, Presse und Organisationen des Judentums in den Vereinigten Staaten und Kanada (Statistics, Media, and Organizations of Jewry in the United States and Canada), is seen in this handout photo.